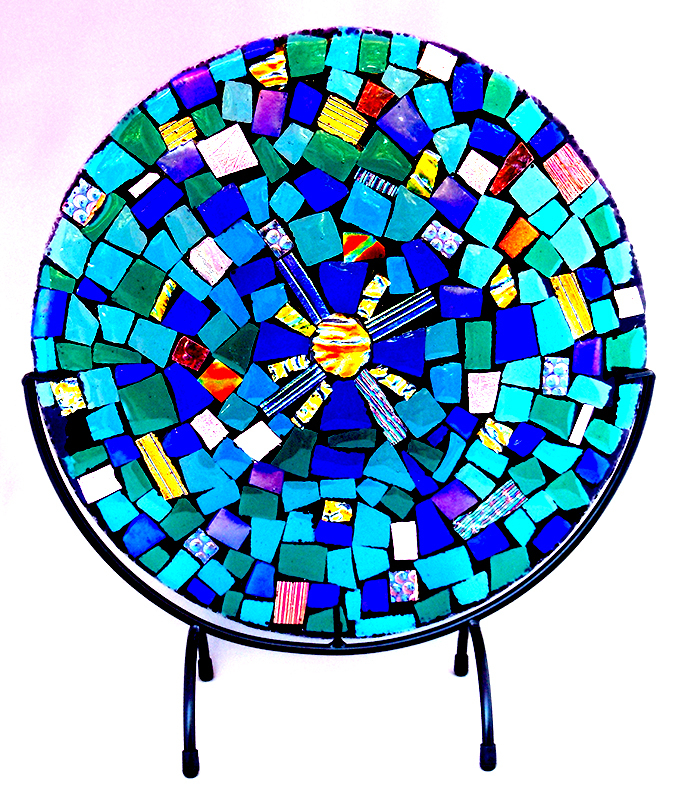 This entry was posted in Art Events, Kiln Formed Glass, Metal & Mixed Media Sculpture on October 11, 2018 by aeshep. “Through the Looking Glass”, Nashville Arts Magazine. Nashville Arts Magazine has honored me with a gorgeous, four page article in the June 2018 issue about me, my work and my exhibit “Building, Dwelling, Thinking”, part of the “Flying Solo” series at Nashville International Airports “Arts at the Airport” program. I am over the moon with appreciation to everyone who worked to make this happen! This entry was posted in Art Events, Kiln Formed Glass, Metal & Mixed Media Sculpture on May 31, 2018 by aeshep. The Birthstone Collection – Now Available Online! Say hello to Turquoise Sky, the birthstone of December. The visual effect of the mix of brilliant blues and sunset colors made it easy to choose her name. And there’s a piece for every month of the year! 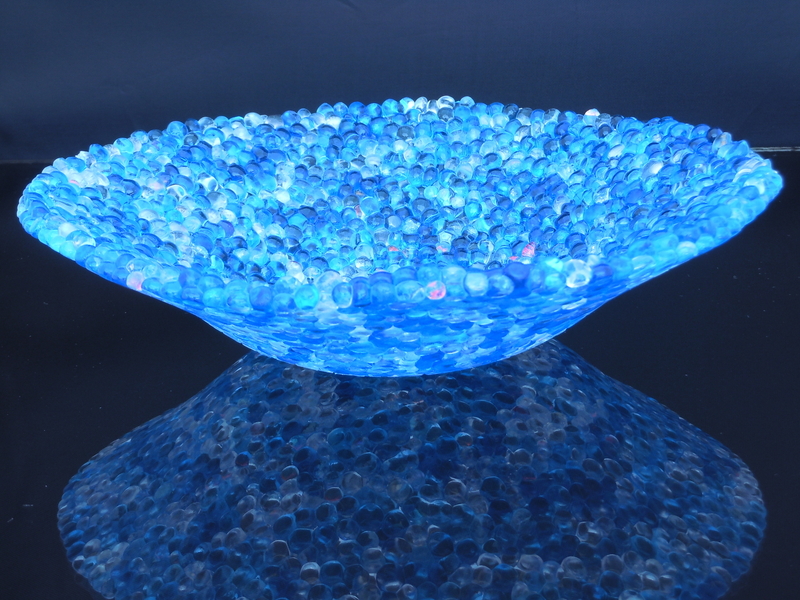 These substantial bowls weigh 22 ounces and are approximately 8-1/2″ in diameter by 2-3″ deep. AND if that isn’t enough…I am just back from setting up at Treasures for the Holidays at Gaylord Hotel and Resort (https://www.facebook.com/treasuresfortheholidays) with the “Birthstone Keepsake Collection”, mini versions (5″ diameter) of the gallery pieces complete with the most precious little “hat box” you’ve ever seen! It has self-threaded, replaceable ribbon. You just tie the bow and voila! Gift! These are perfect for bedside, bureau, or sink-side as a safe place to hold your valuable rings, earrings and other jewelry while you get on with your busy life. You might say they’re “Gems for Jewels”! I love it when a plan comes together. Stay tuned for updates and enjoy your holidays! 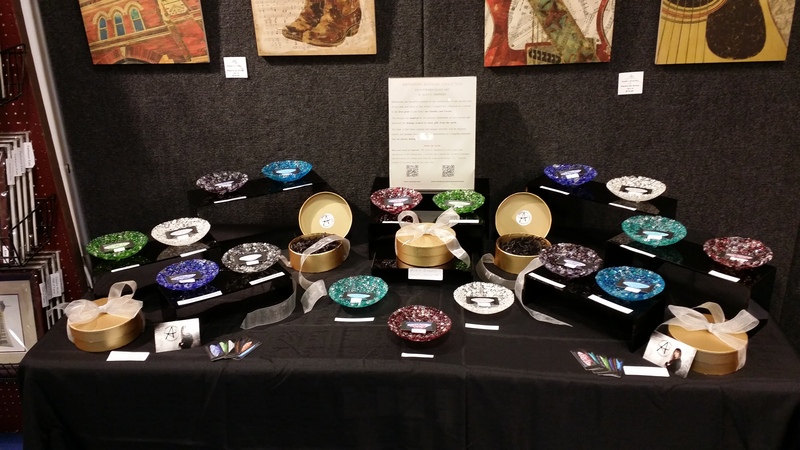 This entry was posted in Art Events, Bowls, Kiln Formed Glass, Uncategorized and tagged art, Arts and Crafts Shows, Birthday Gifts, Christmas Gifts, Fused Glass Art, Gifts, glass art, Loved ones, Meaningful handmade gifts, Tennessee Artist Gifts on November 28, 2014 by aeshep.